This page will guide you through configuration and basic use of the CRM Connect LDAP Add-in.It is expected that you are already familiar with the Address Book, Call History and Preview window, and the basic concepts of integration and screen popping using the Add-ins.See the 'User Guide' for these topics. LDAP and the database used to store your contact data should already be installed and working normally before proceeding with this integration. The LDAP Add-in configuration is split into three groups:Connection, Fields, and Show Contact. On the Connection group, first type the name or IP address of the LDAP server into the 'Server' text box.Your system administrator should be able to tell you this and the remaining information below. Note: you should not be entering a full RDN into this text box e.g. dn: cn=John Doe,dc=example,dc=com. Next, enter your username and password for the LDAP server into the relevant boxes. From the 'Authentication type' dropdown box, select the method of authentication used by your LDAP server and then enter the protocol used in the 'Protocol version' text box.You can either type it in yourself or click the small up and down buttons on the right-hand side. If you want to check that you have entered the correct information, you can click the 'Test' button to see the first few records from the directory. On the Fields group, you will tell the Add-in what the fields in your LDAP directory represent.For example, you might have a field in your directory named ACCOUNT_NUMBER which actually represents the unique Id of the contact. To map an Add-in field to one of your directory's fields, double-click it in the list or highlight the Add-in field and click the 'Edit…' button to open the 'Edit field' window. Then, from the 'Database field' dropdown box, select the field in your directory which corresponds to the Add-in field you're editing, and then click 'OK'. The only Add-in fields you need to map are Id, ContactName and/or CompanyName, plus as many Phone fields as you have in your directory.You can also optionally map the City and Email fields so that they appear in search results. If your contacts have more than three phone numbers or you want to include some other fields from your directory, you can add them by using the 'Add…' button.Type the name you want the new Add-in field to be called into the 'Internal field' text box.Then, select what the field represents from the 'Type' dropdown box.Finally, select the directory field to map to the new Add-in field and click 'OK'. The 'Guess' button will attempt to guess which fields in your data source map to which fields in the Add-in (based on the name of the field). So far, you have configured the ability to search for contacts from the Address Book and to see the name of people calling you in the Preview window. If you want screen popping, so that you can actually go to the contact in your database program from the Preview window or the Address Book, you need to configure the Show Contact action to tell the Add-in what to do when you want to show the contact. The Add-in will run the program or go to the URL that you specify and pass it the command-line parameters that you specify. Use the 'Browse…' button to select the program to run or, to launch a web page, enter its URL into the 'Program to run' text box. In 'Parameters' you can enter the Add-in fields to pass to the program or web page you selected above.For example, you could enter '%Id%' to pass the value of the field mapped to Id to the command-line of the program you selected.If you entered a web page URL in 'Program to run', the parameters are appended to the URL. 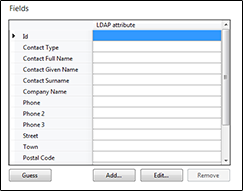 To test if the configuration worked, enter a phone number from your LDAP account into the 'Telephone' box in the 'Integration test' area and click the 'Search' button.The results will be displayed after a few seconds. If the test does not work, go to the 'Log' page of configuration and turn on logging, then do the test again and see if there are any errors in the log.